Many powers are given to aquamarine stones, however aquamarine meaning is focused on enhancing courage and intuition. Aquamarine is a blue-green beryl variety that has been used as a gemstone and stone of power for thousands of years. Aquamarine crystals and stones can help you when meditating, because it soothes the mind giving you the peace of mind required to reach a deep meditative state. Its chakra is the 5th chakra or throat chakra. Aquamarine birthstones: Aquamarine is the modern birthstone of March and sometimes is used as the birthstone of September and December. Replacing the often more expensive sapphire and blue topaz. It is also the traditional birthstone of October. In addition it is the zodiac birthstone of Scorpio and some add Aquarius to that. In history aquamarines have always had a connection with the seas and oceans, because of its blue-green color. Sailors and merchants believed that wearing a piece of aquamarine would offer them protection and would make their trade more successful. Another legend is that you could prolong your life if you drank water with an aquamarine in it. Some ancient Greek and Roman myths mention that aquamarines originate from the treasure chests of mermaids. Again showing the connection between water and aquamarine stones. Aquamarines are mainly used as a soothing stone, to relieve stress. Because of its connection with water it is used to cleanse the body and strengthen the immune system. Disclaimer: Aquamarine healing should not be used instead of regular medical treatment, but in addition to these treatments. Always seek professional help when dealing with health related problems. The beryllium gemstone aquamarine is also excellent for muscle pain and spasms. A single rather large gem can be placed on the area of concern or a necklace of small chips can be worn because its energies will expand throughout the aura and thus will ease pain. It will also relax the emotions which can become anxious with the experience of pain. 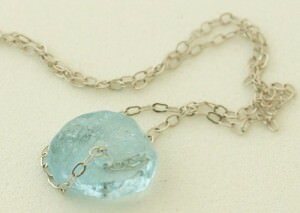 If sleeplessness is a problem because of pain, aquamarine will help to ease a person off to sleep. May all be blessed. I have a chunk of aquamarine. I recently found out that it is helpful for throat issues. I have hypothyroidism. I placed the aquamarine on my neck over my thyroid when I went to bed last night. I slept 8hrs and when I woke up the aquamarine was still where I had placed it on my throat. I must not have moved at all during my sleep!!!! I was born in March so it is also my birth stone.